When it comes to organizing and designing your pallet racks, there’s more to it than you might expect. 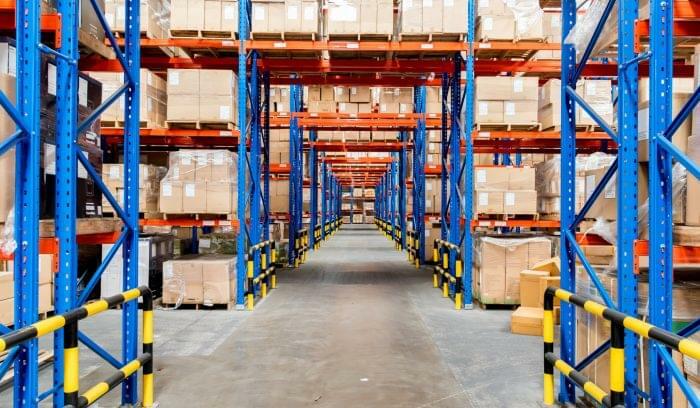 Sure, it’s important to know what size racks you’re getting, but the installation of pallet racks can actually bring a lot of additional considerations to make sure it fits the needs of your warehouse and can store your inventory properly. If you’re considering introducing new pallet racks into your warehouse or you just want to make sure you’re using the ones you have as efficiently as possible, here’s a few tips to help you make sure your pallet racks are set up just like they should be. Measure twice: The first thing you’ll want to do is get as accurate an idea as possible of the space you’ll be using for your pallet racks. Measure the footprint of your storage area and work out the usable square feet you have to work with—not just raw square footage, you need to make sure you factor in things like curbs, columns, pipes, and other building installations that can potentially get in the way of your pallet racks. Look out for obstructions: In a similar vein, you’ll want to make sure that your pallet racks aren’t affecting or blocking anything currently in the area. Keep a careful eye out for things that could pose a hazard and/or negatively impact warehouse operations such as blocked vents, limited access to doors/fire exits, and even blocked power outlets. Make notes on any of your floor plans of potential obstacles that your pallet racks can create and avoid them as you finish your layout. Design your racks as needed: By now you should have a better idea where the racks can go, and the next step is to design them to fit the space you’ve determined you have. Pick pallet rack uprights that won’t collide with the ceiling (or any low-hanging industrial lamps), and find the right pallet rack decking for your typical inventory needs—wire decking tends to offer the most flexibility and easiest access, but denser pallets (or items that won’t move as often) can be kept on steel rack decking instead. Make sure to get proper measurements, too: in most cases a 42” wire pallet rack deck is ideal to provide a safe amount of overhang for standard-sized pallets, but you may want to measure your current pallets and make sure you won’t need more space. Carefully mark out whatever space you’re using: Once everything is all planned out and ready to go, the last thing you’ll want to do is misuse your designated space or accidentally overstep an invisible ‘boundary line’ and create further traffic and usage problems elsewhere. Before you set up your racks, draw careful chalk outlines around the area they’ll be installed and mark off where the uprights will be mounted to make sure your initial floor plan doesn’t need any last-minute changes. Safety first—even after the installation: Finally, even after your racks are safely installed and ready to go, you’re going to need to maintain safety regulations around the racks well into the future. Make sure to check (and double-check) the anchors holding the uprights in place at regularly scheduled intervals, provide safety panels to help manage traffic and prevent accidents, and make sure all of your workers are trained and up-to-date on things like pallet handling and forklift operation, even if they don’t interact with the pallet racks directly.